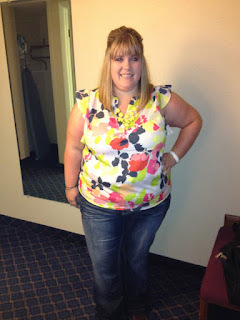 Yes, I wear plus size! And I'm ok with it! I am diving into a subject on this blog that I have never discussed on here. I love fashion and beauty products, but most of my life I have struggled with my weight. Most of the time I am confident in myself, but hey I'm a girl and I have my moments. I have always accepted that I will never be what the typical girl looks like, so instead I have decided to embrace myself. Yes, I am currently trying to do things more healthy and work in more exercise into my daily routine. BUT when it comes to style, I am never going to be buying from Express. It's just not gonna happen. So from time to time I am going to post outfits that I have worn and be ok with the fact that my jeans are from Lane Bryant. I loved a column they used to have in Glamour magazine that focused on the latest trends and how "plus size" girls could work them into their wardrobe. If one lady reads my blog, likes my outfit, and feels good about herself, then I'm calling it accomplished. Us girls who those skinny models might snarl their nose at can lock some hot looks too!